After struggling for pegs on the river for the last round, I didn’t know what to do for round four but then somebody suggested asking a friend of ours if we could use his pond. 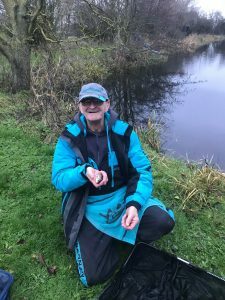 It’s an intimate little venue at the bottom of his garden!, I’ve fished a few matches on it, a long, long time ago, before the blog even started! It used to have a good head of roach and perch along with the odd crucian and tench but it was now a bit of an unknown quantity, I’d seen some decent rudd in the summer taking bread off the top but I didn’t really know what else we could expect. 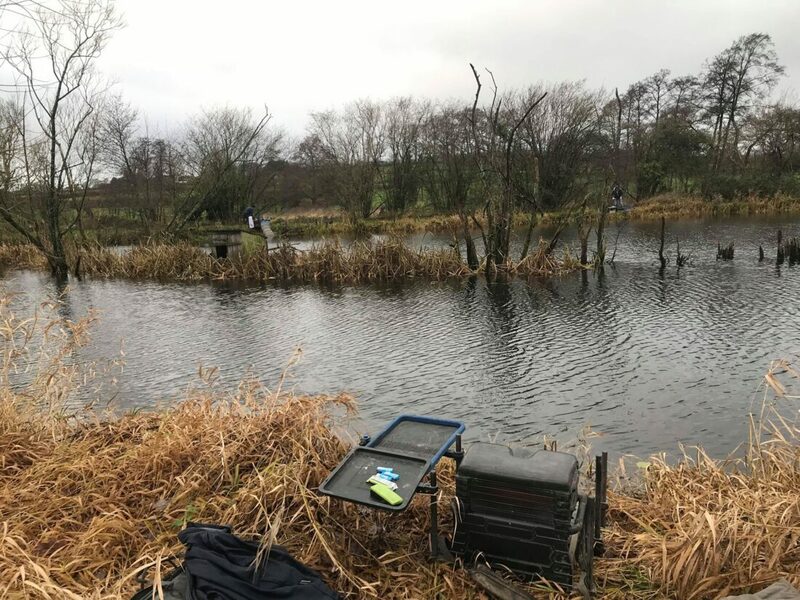 With limited space I felt the only fair way of doing it was to offer the places to the anglers that had fished previous Warehouse League matches. We ended up with eight which would be a bit of squeeze but I was still really looking forward to it. We had breakfast and then headed out to the pond, we walked round and decided on where the pegs were before doing the draw. I ended up with peg 6 which put me on the far side and looked really nice with a little island and some reeds. My neighbours for the day were Leighton on my right and Adie on my left. I got comfortable and started setting some rigs up, Adie commented that he was struggling to find a clear spot and that there was loads of weed and I found the same and just couldn’t get the plummet through it! I went over towards the island at 11.5 metres with a little Preston Chianti and it was a bit clearer. With no groundbait allowed, I had worm, caster and maggot on the side tray. 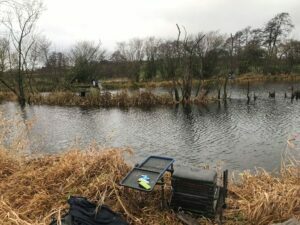 We kicked off at 10:00 and I tried shallow at five metres with casters but didn’t give it long before going over by the island, I was expecting to catch quite quickly but the float just sat there and looking round the pond it was the same for everybody. 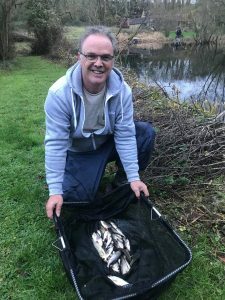 I tried all along the far bank with maggot and caster and never had a touch, I couldn’t believe it, especially after seeing all those quality rudd only a couple of months ago. After about half an hour, Ben over on peg 2 hooked a fish but it came off as he was shipping back and I shouted across that could be costly! Then he had a nice roach followed by Dave next door and not long after Adie had a tiny rudd and I said that was the top three taken care of but fourth place was still up for grabs, Terry ‘The Toast’ then shouted across that he’d caught as well. We were now almost an hour in and I hadn’t had a bite yet and neither had Leighton or Fieldy so a fish would be worth good league points. I was now fishing 13 metres to the tree stumps on the right when the float looked lower in the water, I lifted the pole tip and a tiny rudd came flying out of the water! I shipped back carefully before swinging in a fish that probably wasn’t even quarter of an ounce but it was very welcome all the same! A few minutes later, the float slid along the surface and I struck into a slightly better rudd of around 2oz which I netted to be sure and I thought some better fish might start to show. The three over on the wider pegs opposite (Ben, Dave and Terry) were catching some tiny fish along with the odd slightly better fish and I noticed Terry was fishing about a foot deep so I shallowed up and had a couple of miniature rudd (at least I think that’s what they were, it’s difficult to tell when they’re that small!). Steve P and Fieldy were yet to catch, Adie still only had the one tiny fish and Leighton had a couple of bits so I was doing okay thanks to my bonus! fish. Around three hours in, I struck at a bite expecting another tiny rudd to fly out of the water but this time, some elastic came out and a nice rudd of 4-5oz splashed on the top, I shipped back gently, mindful of the barbless hook but as I went to break the pole down, it jolted and when I lifted the pole up, it had come off – bugger! I just knew that fish was going to cost me. 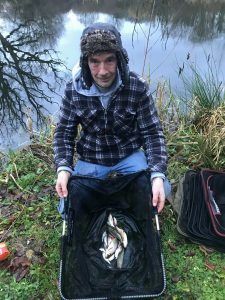 I carried on catching the odd tiny fish and although the top three places looked to be sewn up, I thought I was in with a good chance of fourth spot. Leighton was getting the odd small fish but couldn’t get close enough to the island with his pole so he set a waggler up and then had a nice rudd almost straight away and there was now nothing between us. With around 90 minutes left, the light was starting to fade and I jokingly said we still had the ‘Golden last hour’ to look forward to! 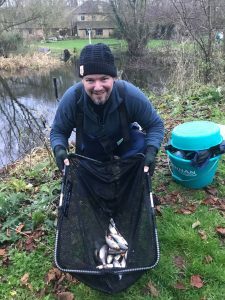 But then a few more fish started to show, Steve and Fieldy got off the mark, Dave was getting a few and Ben and Terry were catching regularly and it would be between those two for top spot. I was still getting the odd fish but they were so small I was bouncing a lot of them off on the strike! 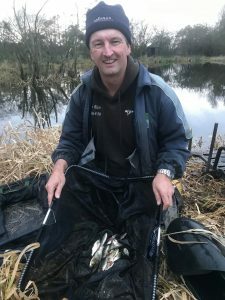 Leighton had a couple more slightly better rudd and I felt he’d edged in front of me and then with about half an hour to go, I had a decent bite and struck into want felt like a much better rudd, it nodded a couple of times and then the hook pulled out – gutted again! I plugged away catching the odd tiny fish and as the light really started to go in the last half an hour it was a bite a chuck but I don’t think anyone was too upset when I called the all out! My final tally was 28 rudd and I wasn’t sure I’d broken a pound! Adie had managed five small fish and Fieldy and Steve both had two, so it had been a real struggle round our side. I quickly packed up before starting the weigh in with Steve on peg 1, his two fish went 2oz (and he paid me a pound), Ben was next and had some decent roach to weigh 1lb 15oz, Dave had 1lb 5oz and then Terry had loads of small fish for 2lb 1oz. Leighton had 1lb 4oz and then it was turn, my fish weighed 1lb exactly so those two lost fish had been really costly, one would have been enough for third. I also lost a pound to Leighton but forget to pay him (sorry mate, I’ll let you have it at the next match). The last two to weigh were Adie and Fieldy who had 2oz apiece. So another disappointing day although I did have my chances! I had such high hopes for today but I did suspect the worst after not being able to find a clear patch plumbing up. On the plus side I scored 2 points in the league so after four matches and dropping the worst result, I’m still leading with four points but there’s a long way to go. There’s still time to vote for the blog in the UK Blog Awards and if you have already voted, thank you so much but please spread the word and lets get Against Men and Fish shortlisted!